Your young D'Artagnan will look as if he has stepped directly from the pages of the legendary novel by Alexandre Dumas'! Our magnificent tabard will allow him to cut a swashbuckling path through any crowd. Crafted from sturdy, yet rich, blue cotton velvet and lined in matching satin. 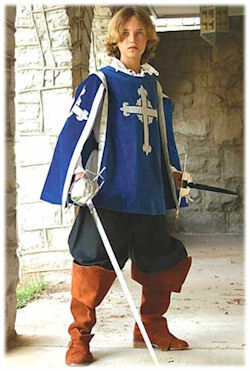 The tabard features the silver cross and fleur-de-lis embroidered on the sleeves and chest. We recommend dry clean only. One size.